Rayovac® hearing aid battery packaging was honored by the World Packaging Organisation, earning the WorldStar Package Award for its innovative hearing aid battery package design. Rayovac®, in collaboration with Plastic Ingenuity, reinvented its hearing aid battery package to address the unmet need of the millions of people living with hearing loss. The 2018 packaging innovation includes: longer tabs* for easier handling, a unique ratcheting dial design allowing consumers to easily remove one battery at a time, and a recloseable dial for secure storage. The WorldStar Package Award is an international achievement given to packages superior in design and technology to others within its category across the globe. Rayovac® was titled a 2018 Ameristar Package Award holder, qualifying the hearing aid battery package for the global recognition from WPO. Rayovac® products are some of the world’s leaders in battery power and innovation. Backed by a long history of bringing the latest innovations to the marketplace, Rayovac® offers a full range of high-performance batteries to meet the power needs of today’s consumers. From long-lasting alkaline batteries to mercury free, enhanced hearing aid batteries, Rayovac® state-of-the-art products offer long lasting power at an affordable price. The company also manufactures a wide selection of high-quality flashlights. For more information, visit www.rayovac.com. Spectrum Brands, Inc. RAYOVAC® division, the world's leading hearing aid battery manufacturer*, has earned the Progressive Grocer Editor’s Pick Award for its new hearing aid battery packaging. Rayovac partnered with Plastic Ingenuity to redesign its hearing aid battery package and to create an improved user experience. The new packaging launched in 2018 and includes many improvements that uniquely address consumer concerns including: longer tabs** for easier battery handling, a design that allows consumers to easily remove one battery at a time and a removable dial for convenient transport or storage. "Our goal at Rayovac is to delight consumers with our products. This goes beyond outstanding battery technology to include the package as well,” said Sarah Bolstad, senior marketing manager at Rayovac. “Based on consumer feedback, we knew we could improve our packaging. The new hearing aid battery packaging resolves consumer pain points and provides greater product protection**." * Based on worldwide manufacturing market share. RAYOVAC is a brand of consumer products owned by Spectrum Brands Inc. Rayovac products are some of the world's leaders in battery power and innovation. Backed by a long history of bringing the latest innovations to the marketplace, Rayovac offers a full range of high-performance batteries to meet the power needs of today's consumers. From long-lasting alkaline batteries to mercury free, enhanced hearing aid batteries, Rayovac's state-of-the-art products offer long lasting power at an affordable price. The company also manufactures a wide selection of high-quality flashlights. For more information, visit www.rayovac.com. Spectrum Brands Holdings, Inc., is a global and diversified consumer products company and a leading supplier of consumer batteries, residential locksets, residential builders' hardware, plumbing, shaving and grooming products, personal care products, small household appliances, specialty pet supplies, lawn and garden and home pest control products, personal insect repellents, and auto care products. Helping to meet the needs of consumers worldwide, our Company offers a broad portfolio of market-leading, well-known and widely trusted brands including RAYOVAC®, VARTA®, KWIKSET®, WEISER®, BALDWIN®, NATIONAL HARDWARE®, PFISTER®, REMINGTON®, GEORGE FOREMAN®, RUSSELL HOBBS®, BLACK+ DECKER™ FARBERWARE®, TETRA®, MARINELAND®, NATURE'S MIRACLE®, DINGO®, 8-IN-1®, FURMINATOR®, IAMS® (EUROPE ONLY), EUKANUBA® (EUROPE ONLY), DIGEST-EEZE™, HEALTHY-HIDE®, LITTERMAID®, SPECTRACIDE®, CUTTER®, REPEL®, HOT SHOT®, BLACK FLAG®, LIQUID FENCE®, ARMOR ALL®, STP® and A/C PRO®. Spectrum Brands' products are sold by the world's top 25 retailers and are available in more than one million stores in approximately 160 countries. Based in Middleton, Wisconsin, Spectrum Brands Holdings generated net sales of approximately $5.01 billion in fiscal 2017. For more information, visit www.spectrumbrands.com. Spectrum Brands, Inc. RAYOVAC® division, the world's leading hearing aid battery manufacturer*, has earned the AmeriStar Package Award for its new hearing aid battery packaging. Rayovac partnered with Plastic Ingenuity to redesign its hearing aid battery package and to create an improved user experience. The new packaging launched in 2018 and includes many improvements that uniquely address consumer concerns including: longer tabs** for easier battery handling, a unique design that allows consumers to easily remove one battery at a time and a removable dial for convenient transport or storage. "Our goal at Rayovac is to delight consumers with our products. This goes beyond outstanding battery technology to include the package as well," said Sarah Bolstad, senior marketing manager at Rayovac. "Based on consumer feedback, we knew we could improve our packaging. The new hearing aid battery packaging resolves consumer pain points and provides greater product protection**." "The team at Plastic Ingenuity is thrilled to have won the prestigious AmeriStar Award for Health & Beauty Aids packaging, and we're proud to be serving the needs of today's hearing-impaired consumers," said Rob Helmke, marketing director at Plastic Ingenuity. "As modern technology continues to evolve, we'll be keeping our eyes on today's diverse packaging needs, aiming to create innovative designs that are user-friendly, Earth-friendly, and wallet-friendly." 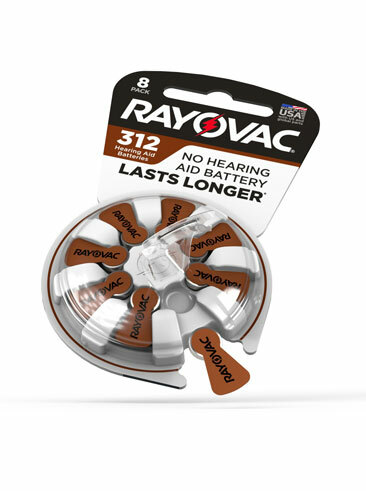 Rayovac® combines its most advanced hearing aid battery technology with innovative packaging. Rayovac, the world's leading hearing aid battery manufacturer* and a division of Spectrum Brands, Inc., has developed its most advanced battery system based on input from both hearing aid wearers and hearing health professionals. Rayovac's new PRO LINE® Advanced combines long lasting power** with an easy to use package. "Our goal with PRO LINE® Advanced is to answer the unmet needs of hearing aid wearers. To do this we gathered input from daily users and hearing health professionals in developing our new technology and packaging," said Ann Rule, Senior Director of Marketing at Spectrum Brands' Rayovac Division. "The innovations make the batteries last longer than our previous formulation** and easier to store, handle and use." An Optimized Form to provide more critical ingredients and deliver more capacity than Rayovac's previous design. 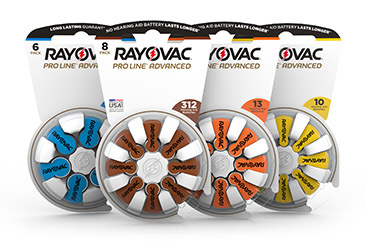 In addition to improving the technology, Rayovac re-invented the traditional dial-package. Rayovac research revealed patients were frustrated with their hearing aid battery packaging. To address this issue, Rayovac has made the package easier to handle and added several new features designed to keep the batteries clean, more secure and protected than the previous Rayovac packaging. A new lock dial system, which prevents the package from spinning freely, giving the user more control. A prominent forward-facing front door allows the user to see and lift each individual battery out of the package without having to flip the package over. Longer and wider tabs make it easier to see, remove and handle batteries. User-friendly package size and shape is designed to fit easily in an open hand and has a perforated rounded edge, making the dial removable for convenient transport or storage. Rayovac's most advanced hearing aid battery delivery system will be available on its PRO LINE® Advanced line through hearing health professionals on January 3, 2018. "Consumers and hearing health professionals expect great products from Rayovac, and our PRO LINE® Advanced hearing aid batteries deliver," said Kevin Kouba, Division Vice President at Spectrum Brands' Rayovac Division. "Active Core Technology and the new, easy-to-use packaging are just the very latest in a long string of innovations. We look forward to continuing to help advance hearing care in the future." *** Reported by size 312 users in 2017 field study (results varied by use and device, excludes size 675). 1 Based on ANSI/IEC performance tests for sizes 312, 13 and 10, (excludes size 675). 2vs. Rayovac's previous formulation (excludes size 675). 3 Made in the USA with US and global parts. Spectrum Brands Holdings, Inc., (NYSE: SPB) is a global and diversified consumer products company and a leading supplier of consumer batteries, residential locksets, residential builders' hardware, plumbing, shaving and grooming products, personal care products, small household appliances, specialty pet supplies, lawn and garden and home pest control products, personal insect repellents, and auto care products. Helping to meet the needs of consumers worldwide, our Company offers a broad portfolio of market-leading, well-known and widely trusted brands including Rayovac®, Varta®, Kwikset®, Weiser®, Baldwin®, National Hardware®, Pfister®, Remington®, George Foreman®, Russell Hobbs®, Black + Decker™, Farberware®, Tetra®, Marineland®, Nature's Miracle®, Dingo®, 8-IN-1®, Furminator®, Iams® (Europe Only), Eukanuba® (Europe Only), Digest-eeze™, Healthy-Hide®, Littermaid®, Spectracide®, Cutter®, Repel®, Hot Shot®, Black Flag®, Liquid Fence ®, Armor All®, STP® and A/C PRO®. Spectrum Brands' products are sold by the world's top 25 retailers and are available in more than one million stores in approximately 160 countries. Based in Middleton, Wisconsin, Spectrum Brands Holdings generated net sales of approximately $5.01 billion in fiscal 2017. For more information, visit www.spectrumbrands.com. The world's leading hearing aid battery manufacturer* is the first hearing aid battery manufacturer to obtain a medical device license (MDL) for zinc air hearing aid batteries from Health Canada. Achieving this license is an affirmation to the 360 million people around the globe with disabling hearing loss that Spectrum Brands', Inc. Rayovac brand can be counted on to deliver high quality, innovative hearing aid batteries. "Obtaining the license from Health Canada is an assurance to our professional and retail customers in Canada that Rayovac will be there to meet their hearing aid battery needs," said Kevin Kouba, Division Vice President of Hearing Aid Batteries at Spectrum Brands, Inc. "Since some manufacturers do not yet have the required MDL, we are seeing this as an important competitive advantage for our customers, as well as Rayovac." According to Health Canada, "batteries are considered medical devices when they are designed, manufactured and labelled specifically for use with medical devices." Hearing aids and hearing aid batteries are Class II medical devices, which means special licensing is required. To fulfill these requirements, hearing aid manufacturers must obtain an MDL from Health Canada. Before issuing a license, Health Canada assesses the output systems for safety, effectiveness and compliance with labelling and other requirements. Since Rayovac's robust quality system has been ISO certified since the 1990s, the company's batteries already met most of the requirements for Health Canada's MDL. Any changes made were focused on labeling and enhanced documentation processes. "Complying with Health Canada's standards has impact beyond just our Canadian customers," said Ann Rule, Senior Director of Marketing at Spectrum Brands, Inc. Rayovac. "All of our customers, regardless of market, will benefit from the processes we put into place to meet these requirements. This accomplishment is another indication that Rayovac hearing aid batteries are always at the forefront of quality and safety."